↑ Whitney, Elanor and Sharon Rolfes. 2005. Understanding Nutrition, 10th edition, p 6. Thomson-Wadsworth. ↑ FRANCES SIZER; ELLIE WHITNEY (12 November 2007). 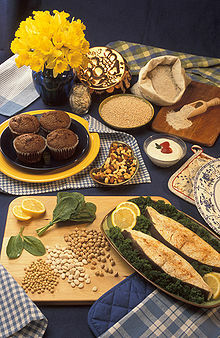 NUTRITION: CONCEPTS AND CONTROVERSIES. Cengage Learning. পৃষ্ঠা. 26–. ISBN 978-0-495-39065-7. http://books.google.com/books?id=mDhMU0Sv6asC&pg=PT26। আহৰণ কৰা হৈছে: 12 October 2010. ↑ Mark Kern (12 May 2005). CRC desk reference on sports nutrition. CRC Press. পৃষ্ঠা. 117–. ISBN 978-0-8493-2273-0. http://books.google.com/books?id=uOYqeeXWomwC&pg=PA117। আহৰণ কৰা হৈছে: 12 October 2010. ↑ David Sadava; H. Craig Heller; David M. Hillis; May Berenbaum (2009). Life: The Science of Biology. Macmillan. পৃষ্ঠা. 767–. ISBN 978-1-4292-1962-4. http://books.google.com/books?id=ANT8VB14oBUC&pg=PA767। আহৰণ কৰা হৈছে: 12 October 2010. ↑ J. Benton Jones (1998). Plant nutrition manual. CRC Press. পৃষ্ঠা. 34–. ISBN 978-1-884015-31-1. http://books.google.com/books?id=rNP2exwYMJIC&pg=PA34। আহৰণ কৰা হৈছে: 14 October 2010. ↑ New Link in Chain of Life, Wall Street Journal, 2010-12-03, accessed 2010-12-05. "Until now, however, they were all thought to share the same biochemistry, based on the Big Six, to build proteins, fats and DNA." ↑ CHNOPS: The Six Most Abundant Elements of Life, Pearson BioCoach, 2010, accessed 2010-12-09. "Most biological molecules are made from covalent combinations of six important elements, whose chemical symbols are CHNOPS. ... Although more than 25 types of elements can be found in biomolecules, six elements are most common. These are called the CHNOPS elements; the letters stand for the chemical abbreviations of carbon, hydrogen, nitrogen, oxygen, phosphorus, and sulfur."